Reason #1.2 for running a marathon… Raising money for a spectacular cause. Reason #2 for running a marathon… Carboloading!!! Day 2 was spent carboloading, walking, and learning. The city has come alive with runners. You can identify them by their technical fabric clothing and comfy walking shoes. We started the day with a little walk ending at Nike Town, where we picked up the shuttle to the health and fitness expo to pick up our bibs and timing chips. 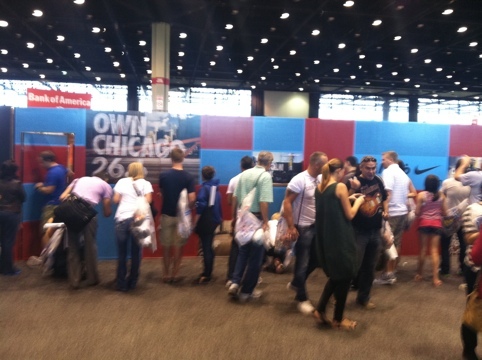 The expo was fun, and we learned some things to help us through Sunday. A fun surprise was the Nike wall with every single runner’s name on it. 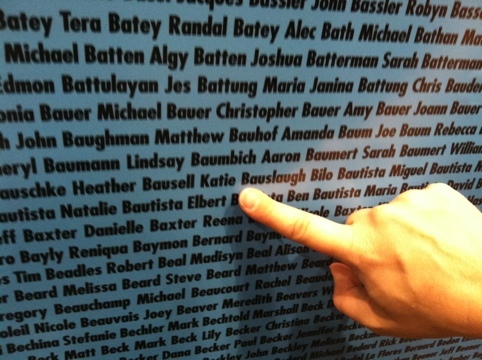 We found our names and got a poster that matched. The names on the poster are so little that you pretty much need a magnifying glass to read them. We ended the day pretty lazily with dinner and early bedtime. Day 2 in the books.